An iconic Toronto discount store known for its bright neon lights and cheesy puns on store signs may soon be a thing of the past. 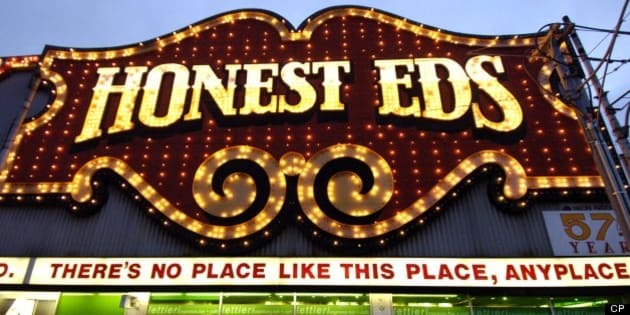 According to a report in the National Post, Honest Ed’s has been quietly put up for sale, and the property at the corner of Bloor and Bathurst Streets could fetch as much as $100 million. Commercial real estate agency Colliers is reportedly representing the property. UPDATE: Honest Ed's general manager Russell Lazar has confirmed to the Toronto Star the store is up for sale. News of the sale is likely to cause consternation among the many Torontonians who shop at the discount store and those who see the neon-covered building as a landmark. Its folksy signage ("How cheap can a guy get? Come in and find out!") has been amusing residents for decades. But speculation is already abounding that Honest Ed’s will be replaced by the same thing being built in just about every other available corner of Toronto — a condo tower. Condo developer Brad Lamb told the Post he foresees “a 10- to 12-story” condo building on the site. Mirvish is already involved in condo development. He has launched the development of three 80-story towers in the city’s entertainment district on King Street, designed by renowned architect Frank Gehry. The project is currently under review by the city. Ed Mirvish opened Honest Ed’s in 1948. He died in 2007, having become a mainstay of Toronto’s retail and cultural scenes. Besides building a retail and real estate empire, Mirvish also took an active interest in Toronto’s theatre scene, buying up some of the city's landmark theatres and running an eponymous production company. Mirvish was also known for his acts of charity, handing out whole turkeys to passersby on Christmas and Thanksgiving.